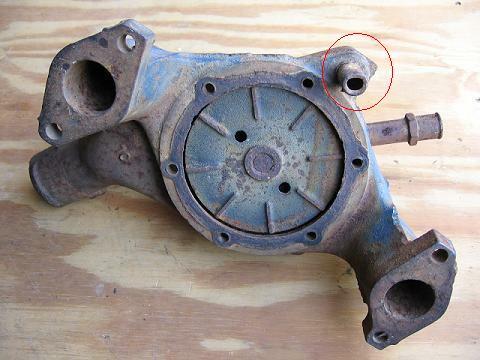 Ford water pumps are identified using basic part number 8501. Like most water pumps of the time, the pump used on 428 CJ and SCJ engines is driven using a belt and pulley arrangement. 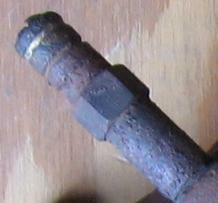 The pulley bolts to a flange on the front of the pump. The belt routes around the crankshaft pulley, turning the pump with each rotation of the crank. Ford appears to have used three different pumps on Cobra Jet Mustangs during the course of production. Eventually, the same service part was used for all three model years. The April 1969 Master Parts Catalog was used to determine the original 1968 and 1969 service parts numbers described below. Note that it says that the same pump was used on 1968 390s and 427s, and the 1969 pump was used on 390 GT, 428 CJ, 428 SCJ engines. 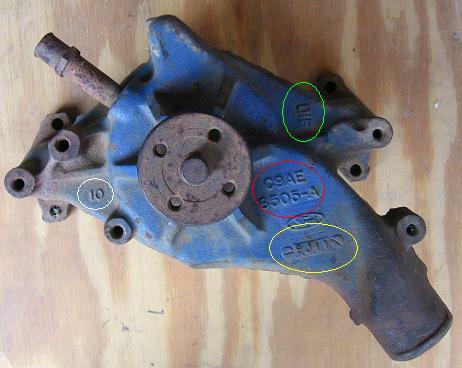 The engineering numbers DO NOT correspond to the "casting number" found on the pump housing. 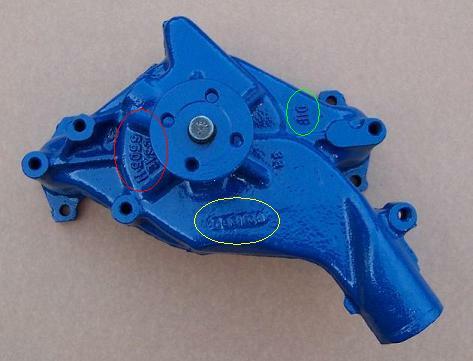 The casting number on the housing represents the engineering number for the housing itself, not the pump assembly. I should explain that I'm still not sure of the differences between the listed 1969 and 1970 pumps, though I believe the same housing was used for both. At least I've seen date codes to support that theory. What's the difference? 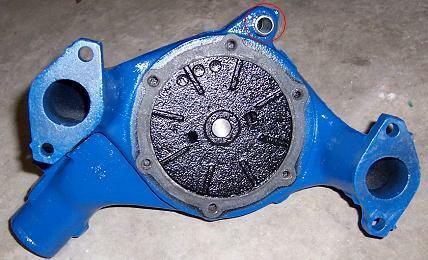 Starting with the 1969 pump Ford began using a larger internal bearing. In general, a larger bearing would tend to improve durability. The bearing change required changes in the shape of the housing; note the differences in the pictures below. Housing engineering numbers are circled in red. Date codes are circled in yellow. Foundry marks are circled in green ("DIF" = Dearborn Iron Foundry, "CF" = Cleveland Foundry, and "MCC" = Michigan Casting Center). The number circled in white on the 1969 pump is a mold cavity identifier. Notice that the 1969-1970 water pump shown above appears to have a replacement heater hose fitting. The correct fitting is shown below. I've read detailing references that describe the fitting as being both unpainted (Mustang Monthly March 1994) and painted (Mustang Monthly July 1990). Based on the pumps I've seen I have to believe that these fittings were originally installed after the engine itself was painted, so it's probably correct to leave the fitting unpainted. I've heard rumors that the 1969 pump used a larger impeller than was used in the earlier 1968 pump. Here are some shots of the back of the impeller used in the 1968 and 1969 pumps shown up above. It's hard to tell from this view, but they look pretty similar to me. Notice the fitting circled in red in the picture above. This fitting is where the water pump bypass hose is attached to the water pump; the other end of the hose is secured to a fitting on the front of the intake manifold using tower-style Wittek clamps. This bypass system allows coolant to circulate in either direction before the thermostat opens. It also provides an extra path through the pump when high RPMs increase the flow of coolant through the engine. The clamps and hose were typically installed and in-place when the engine was painted, so they should normally wear the same color blue as the rest of the engine assembly. Thanks to Tom Cherry, Chris Teeling, Royce Peterson, Phil Parcells, and Bill Upham of Mansfield Restoration Parts for helping with the pictures and information used here.